is on the mind of every business owner. After all, it makes sense that we would want to protect what we have worked so hard to build. The question then becomes…..How? How do we make sure not only our company itself, but our customers and employees are safe? It starts with paying attention to these 5 things! Protecting your company starts with your hiring practices. Taking the time from the beginning to hire the best and safest people for the job is simply good business. That is why hiring should always be approached with caution. You need to remember that your employees are a reflection of your business. They are often the first “face” your customers see. Making a hiring mistake can actually harm your brand and put your other employees, and your clients, in jeopardy. That is why choosing them needs to be done carefully. And while all business owners are focused on the bottom line, skipping the employment background check is not the way to go! Doing a good employment background check is actually more cost effective than hiring the wrong person for the job. 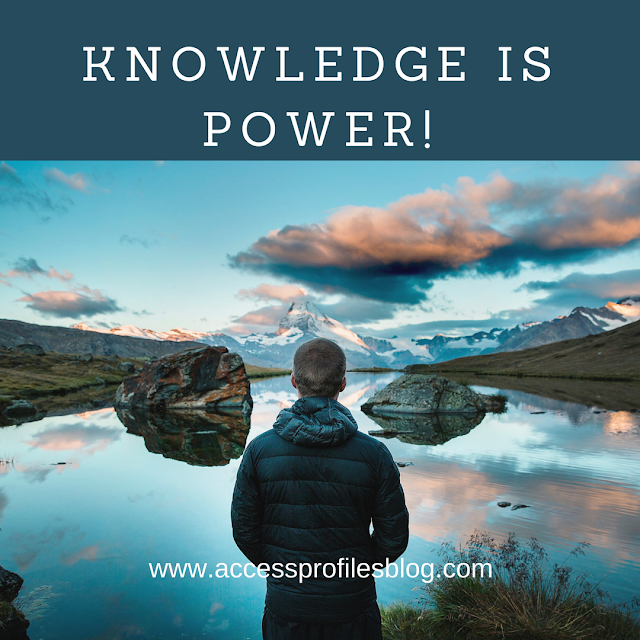 Remember, Knowledge is Power, especially when it comes to hiring! 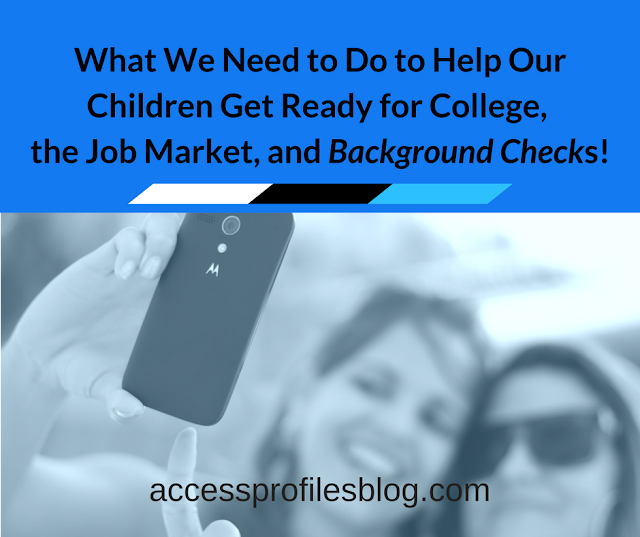 Find out more about the importance of Employment Background Checks here! While most employers understand the benefits of using background checks when hiring, the idea of re-screening existing employees is harder to grasp. After all, you have already checked them once ~ isn’t that enough? The answer is No! There are legitimate reasons why re-screening makes sense and relying on the theory of “one and done” is unwise. 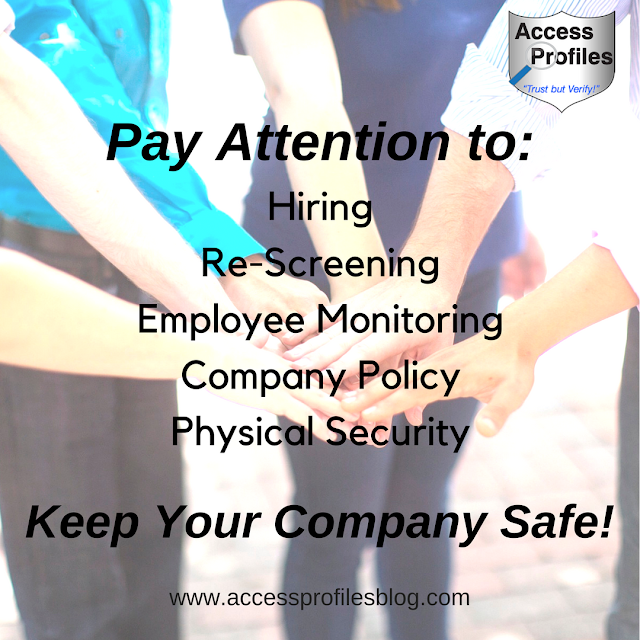 Once hired, it is more than likely that your employees will have increasing access to company information and assets. And as they advance, they will be seen more as the “face” of your company than ever before. That is why it is important to understand the why and when of re-screening your existing employees. Knowing “When” to re-screen is just as important. Re-Screening your existing employees is a good addition to the arsenal of tools you should use to Keep Your Company Safe. When you talk about monitoring your employees, it is important to understand that it can mean observing both “at work” and “online” behavior. In the workplace, your employees need to do their jobs as safely as possible. If the job is physical, then it is common sense that they must follow all rules and procedures when it comes to their job duties. 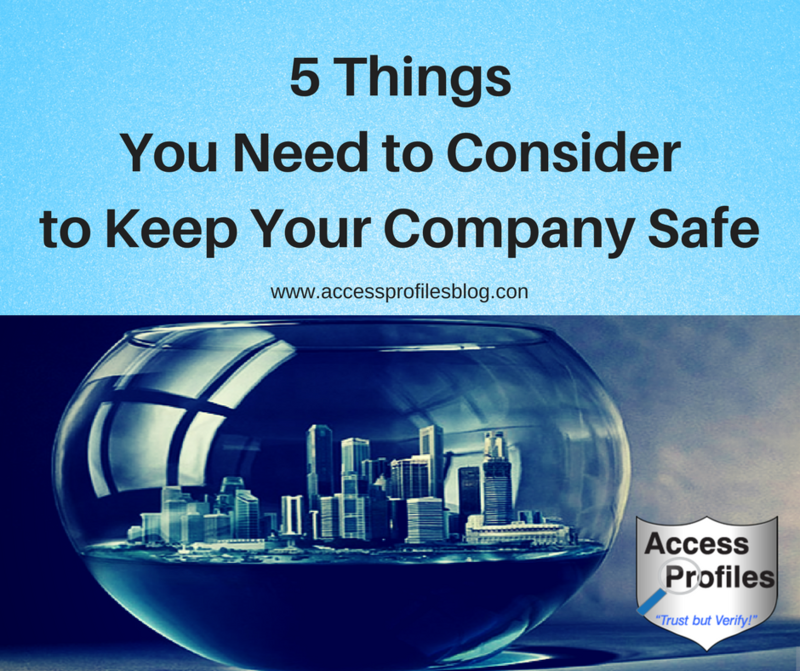 However, there also needs to be safety regulations when it comes to other types of positions within your company. 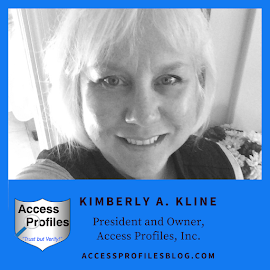 These rules include protecting proprietary company information, business assets, and the personal information (PII) of your customers and employees. You, as the owner, those in management positions, and any of your other employees who come in contact with these must recognize the importance of keeping them safe. In addition, they must also be willing to help each other stay compliant with these rules. Learn more about Personally Identifiable Information (PII) and how to keep it safe in “Tips to Help You Safeguard PII in Your Business”. Monitoring your employees’ “online” behavior can be more problematic. While it is common sense that you would want to protect your company “brand”, you must take into account your employees’ right to free speech. It is important that when doing any type of social media observation that you not consider anything beyond what is necessary to protect your company’s interests. You must also be careful to take into account the privacy of your employees. that could create a problem in the workplace. This monitoring can be informal, as in casual daily observations, or more formal, such as periodic scheduled observations. The key is to get all your employees on board and involved. After all, they see each other day in and day out and know each other better than anyone else. They will be the first to recognize any dangerous, erratic, or unusual behavior by their fellow employees. It is also a great way to achieve employee productivity and continual improvement. Find out more about the importance of Employee Monitoring in “Workplace Safety Needs to be a Team Effort”! The physical security of your company is just as important as being focused on employee behavior and information protection. While the scope will vary depending upon the type of business you run, there is no doubt that it needs to be addressed. Check out our Security Services to find out more! As part of your focus on security, you should create a disaster plan in the event of an incident of workplace violence or a natural disaster. This plan should address the possibility of an active shooter. You also need to establish procedures to follow in the event of an emergency and schedule time to practice them. It is equally as important to develop a plan for dealing with both on-site and community tragedies. Read “What You can Do to Help Your Employees Deal with Tragedy” for more tips to help! Promoting employee monitoring practices and re-enforcing your dedication to Physical and Social Media Security makes sense. That is where creating a strong Company Policy comes in! and the training programs you have established to get and keep them there. Creating your policy should begin by taking a look at your job descriptions. Knowing your goals and objectives for each position within your company will help you determine what behavior is necessary to keep your workplace safe and productive. Addressing social media use within your company policy is crucial. You should be specific about what types of online communication is acceptable and what is not. Including to what extent you intend to monitor your employees online is key. Learn to write a good Social Media Policy here! Your company policy should continue with strong Employee Training for each position. This includes training in physical job duties, safe handling of company and customer information, and the use of social media. Your policy should conclude with your procedures for safely reporting any unusual or potentially unsafe workplace behavior. It is important that your employees feel supported and unthreatened. 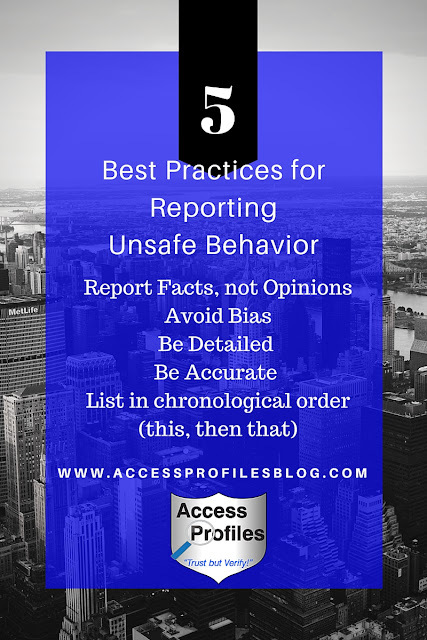 Outlining clear procedures within your policy for how, when, and why to report any unsafe behavior is key. Check out these “5 Best Practices for Reporting Unsafe Behavior” to help! Workplace safety should be part of your Company Culture. To get everyone involved, it needs to be front and center in your company policy. That is the best way to promote a team atmosphere. The responsibility to protect your employees, information, and business lies with you. creating a company culture that takes Workplace Safety seriously. and trickle down to all your employees. Fostering the safest work environment you can should be your ultimate goal! And be sure to Subscribe Now to our blog. Thank you for the reminders. It is easy to think that this is just for big companies but you are right. I appreciate that Anne! Business Owners need to remember to do what they can to keep their companies and their employees as safe as possible.